Today we had a chance to sit back and watch the other teams in the League win, lose or draw. We now know that we have to win tomorrow to regain our tenth place at the minimum but we could go even higher if we can beat Grays by a clear three goals. It's not impossible playing the way that we are at the moment and with Grays struggling near the bottom we have a really good chance. The only problem is going to be putting previous meetings with the Londoners to one side. Last season we lost 5-1 down there and we have never won there in three seasons. Following the televised victory over Torquay on Thursday evening we should still be injury free with the only possibility of Andy Ferrell missing the game after having stitches in a face wound. The Mad Dog could also be called the Iron Man too because he was overheard telling the Physio to just tape it up so he could get back on there. Russ Penn also received a facial injury but after a bit of treatment he was back on in the thick of it two minutes later. 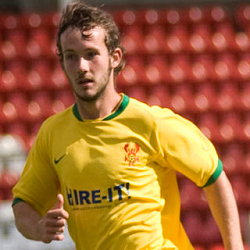 Grays strengthened their side before the deadline by bringing in the former Torquay midfielder, Lee Canoville, from Notts County. A few days earlier Stuart Thorogood rejoined them from Gillingham after following the former Grays manager Mark Stimson there. Yesterday they sent out defender Mark Haines to East Thurrock on loan for a month. They also dispensed with the services of the former Harriers defender Jon Munday recently. Grays aren't believed to have any players missing through injury or suspensions. It's time we broke our duck at Grays and tomorrow we will. Bartlett, Coleman, Baker, Riley, Bignot, Lowe, Ferrell, Creighton, Bowler, Jones, Foley, Knights, McDermott, Bennett, McGrath, Brittain, Penn, Barnes-Homer, Smikle, Richards. Flitney, Arnold, Canoville, Gier, Stuart, Ashton, Downer, Elliott, Sloma, Taylor, Kedwell, Welsh, Bailey, Wilnis, Cogan, Ide, Molesley, Campana, Reid, Thurgood.